Background and objectives Accurate prediction of prognosis may improve management of patients with idiopathic membranous nephropathy. This study compared the Toronto Risk Score and urinary low-molecular weight proteins. Design, setting, participants, & measurements One hundred four patients with biopsy-proven idiopathic membranous nephropathy who presented between 1995 and 2008 with a well-preserved kidney function and nephrotic range proteinuria were included. Urinary β2-microglobulin and α1-microglobulin measurements were obtained by timed standardized measurements, and the Toronto Risk Score was calculated using data obtained from medical records. The endpoint was progression, which was defined as an increase in serum creatinine>50% or >25% with a concentration>135 μmol/L. Results Forty-nine patients showed progression. The area under the receiver-operating characteristics curve was 0.78 (95% confidence interval=0.69–0.88) for the risk score versus 0.80 (0.71–0.89) and 0.79 (0.71–0.88) for urinary β2- and α1-microglobulin, respectively. Differences were not significant. 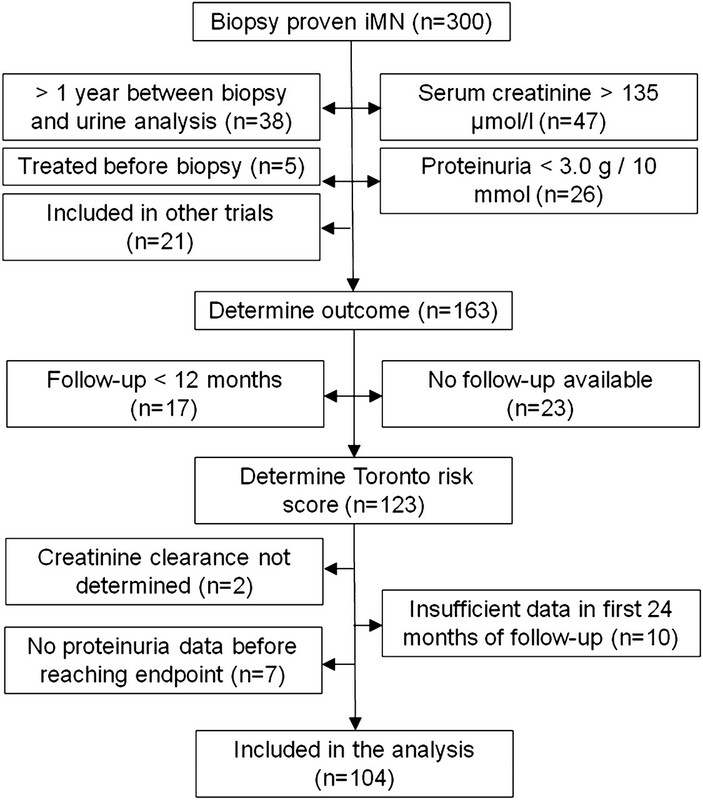 Persistent proteinuria did not add accuracy to the Toronto Risk Score. Conversely, its accuracy was not reduced when data from the first 6 months of follow-up were used. Furthermore, a score based on GFR estimated with the six-variable Modification of Diet in Renal Disease equation, calculated in the first 6 months of follow-up, gave an area under the receiver-operating characteristics curve of 0.83 (0.74–0.92), which was not statistically different from other markers. Conclusions The prognostic accuracies of the Toronto Risk Score and urinary low-molecular weight proteins were not significantly different. The risk score can be calculated within 6 months of diagnosis, and a simplified risk score using estimated GFR–Modification of Diet in Renal Disease may be sufficient. Idiopathic membranous nephropathy (iMN) is a common cause of adult onset nephrotic syndrome. Untreated, approximately 50% of patients with iMN and nephrotic range proteinuria will develop ESRD (1). Conversely, almost 50% of patients with nephrotic iMN develop a spontaneous remission of proteinuria. However, it may take anywhere from a few months to 5 years to occur (2). Thus, a delay in treatment would expose the patient to the complications of the nephrotic syndrome, such as edema, thrombosis, and infections. This dilemma can be tackled through accurate and early prediction of prognosis, because it would allow early treatment and rapid disappearance of the nephrotic syndrome in high-risk patients and avoid unnecessary exposure to toxic therapy in low-risk patients. Almost two decades ago, the work by Pei et al. (3) showed that the magnitude and duration of proteinuria during follow-up predicted prognosis better than baseline proteinuria alone. Subsequently, the work by Cattran et al. (4) created and validated a risk score for the prediction of progression in iMN that was based on the level of proteinuria during a 6-month period of maximum proteinuria, creatinine clearance at the start of that period, and the change in creatinine clearance over the course of those 6 months. Although accurate, this Toronto Risk Score has some disadvantages. One cannot determine in advance when the period of maximum proteinuria will occur; thus, prolonged observation is necessary. Refraining from therapy prolongs patient exposure to risks associated with the nephrotic syndrome. In addition, patients are kept in uncertainty. Alternatively, urinary markers have been suggested to predict progression in iMN (5–9). We showed that urinary excretion of β2-microglobulin (uβ2m) or α1-microglobulin (uα1m) accurately predicted progressive loss of kidney function (10,11). When re-evaluated, both markers showed somewhat lower sensitivity and specificity than before. This finding may be related to either changes in patient characteristics at presentation or improvement in conservative therapy (2). Obviously, these factors may also affect the prognostic value of the Toronto Risk Score. Therefore, we compared the prognostic power of the Toronto Risk Score to the prognostic power of uβ2m and uα1m. In addition, we attempted to adapt the Toronto Risk Score to improve its suitability in clinical practice. Patients with biopsy-proven iMN who attended our clinic for urinary analysis between January of 1995 and June of 2009 were screened. As per standard care, potential secondary causes were ruled out by the treating physician using chest x-ray, serology, and routine laboratory investigations as detailed elsewhere (12). Inclusion criteria were a serum creatinine<135 µmol/L (∼1.5 mg/dl), proteinuria≥3.0 g/10 mmol creatinine, and time between biopsy and urinary analysis less than 1 year, thus excluding patients with renal insufficiency, who invariably have a worse outcome, and patients with persistent non-nephrotic proteinuria, who almost never progress. Exclusion criteria were participation in the intervention arm of a therapeutic trial (13), follow-up duration of less than 1 year, or treatment with immunosuppressive drugs before urinary analysis. Follow-up data were obtained until an endpoint was reached or June of 2010. Patients were followed at our hospital or by nephrologists in referring centers. Patients were treated with diuretics and given dietary sodium restriction, angiotensin-converting enzyme inhibitors (ACEis) and/or angiotensin II receptor blockers (ARBs), and statins according to existing guidelines. Immunosuppressive therapy was advised only in patients with evidence of deteriorating kidney function or severe untreatable nephrotic syndrome. Data of 46 patients were also used in our previous study of low-molecular weight proteins (10). The study protocol was approved by the Radboud University Medical Centre institutional review board, and patients provided informed consent. Details of our protocol for the evaluation of patients with iMN were described elsewhere (10). In summary, patients were instructed to fast overnight, omit the use of diuretics, and take sodium bicarbonate on the evening before and on the morning of the urinary analysis to raise urinary pH, because uβ2m degrades in acidic urine. Timed urine samples were collected, and blood samples were taken. uα1m was measured using a BNII nephelometer (Behring, Marburg, Germany), and uβ2m was measured using ELISA (14). Medical records were used to obtain follow-up data on serum creatinine concentration, urinary protein and creatinine excretion, and medication use. The risk score created in the work by Cattran et al. (4) was calculated as Toronto Risk Score=ex/(1+ex), where x=1.26+0.3 · persistent proteinuria−0.3 · slope creatinine clearance−0.05 · initial creatinine clearance; persistent proteinuria, initial creatinine clearance, and the slope were calculated during either the first 6 months of follow-up or the 6-month period of maximum persistent proteinuria. Creatinine excretion was calculated using the baseline 24-hour urine sample. The total daily urinary excretion of creatinine was assumed to be constant. GFR was estimated with the six-variable Modification of Diet in Renal Disease (MDRD6) formula (15), because the MDRD4 equation is not appropriate in persons with hypoalbuminemia (16). Persistent proteinuria was assessed using protein creatinine ratios obtained from spot urine samples collected during routine follow-up. Because spot and 24-hour proteinuria may differ, we compared the protein creatinine ratio and 24-hour proteinuria at baseline. The sampling methods showed good correlation (r=0.75) and proportional increase (24-hour proteinuria [g/24 h]=0.93×protein creatinine ratio [g/10 mmol creatinine]). Finally, we chose to limit risk score calculation to the first 2 years of follow-up, because more than 75% of patients in the study by Cattran et al. (4) had their period of maximum persistent proteinuria during the first 2 years of follow-up. Moreover, calculations beyond 2 years of follow-up may defeat the purpose of an early marker, because many patients show progression within 3 years (2). We defined progression as a rise in serum creatinine of more than 50%, a rise in serum creatinine of more than 25% and an absolute level higher than 135 µmol/L, or the need for immunosuppressive therapy because of severe nephrotic syndrome as judged by the treating physician (17). Two of the authors (J.A.J.G.v.d.B. and J.M.H.) checked all data to establish that the rise in serum creatinine was consistent, persistent, and independent of the use of other medication. All analyses were performed using Stata 10.1 (Statacorp LP, TX). Means and SDs were calculated for normally distributed variables, and medians with interquartile ranges were used for skewed variables. To obtain an updated prognostic value of the risk score, we created receiver-operating characteristic (ROC) curves and calculated the area under the curve (AUC) with 95% confidence intervals (95% CIs). The ROC-AUCs were also used to compare the risk score with uβ2m, uα1m, and an estimated GFR-based risk score. Subsequently, a logistic regression model was created, containing the individual predictors used in the risk score. Models containing the baseline and change in estimated GFR-MDRD6 instead of creatinine clearance were created as well. These models were used to calculate the integrative discrimination index (IDI) and relative IDI (rIDI) (18). The IDI quantifies the added discriminatory power of a biomarker to a panel of markers already present in a logistic model; thus, it could be used to evaluate the relative contribution of each component of the risk score to the prediction of progression. Finally, Kaplan–Meier curves were plotted by tertiles of the estimated GFR-MDRD6 risk score to check its calibration with the estimated probability of progression. Between January of 1995 and June of 2009, 300 patients with biopsy-proven iMN were screened. Figure 1 shows that 163 patients met the inclusion criteria. In total, 40 patients were excluded, because they had less than 12 months of follow-up or follow-up data were unavailable. Additionally, baseline creatinine clearance could not be determined in 2 patients, 7 patients did not have sufficient data before they reached an endpoint, and 10 patients did not have sufficient data points within the first 24 months of follow-up. Therefore, our analyses were restricted to 104 patients. Flowchart for the inclusion of patients with idiopathic membranous nephropathy in the study. Table 1 shows the baseline characteristics of our study population. The majority of patients was male (64%), and mean (±SD) age was 52±13 years. In general, patients had well-preserved kidney function (endogenous creatinine clearance was 93±31 ml/min per 1.73 m2) and severe nephrotic syndrome, with a mean proteinuria of 8.5±3.3 g/10 mmol creatinine and a serum albumin of 23±6 g/L. Table 2 shows that conservative treatment was initiated or intensified shortly after biopsy in the majority of patients. Ultimately, all patients used ACEis or ARBs, and 87% of patients used a statin during follow-up. We followed all patients for a median of 4.1 years (interquartile range=2.4–6.9). During that time, 47% of the patients showed progression, resulting in a median survival time of 25 months (interquartile range=12–49). Because intensified supportive treatment influences proteinuria, the magnitude and timing of maximum persistent proteinuria may have changed, and thus, the prognostic value of the risk score may have changed as well. Therefore, ROC curves were created to evaluate the prognostic power of the risk score to predict progression. The ROC-AUC was 0.78 (95% CI=0.69–0.88), and neither the ROC-AUC for uβ2m nor the ROC-AUC for uα1m differed significantly from the ROC-AUC of the risk score (Figure 2 and Table 3). Receiver-operating characteristic (ROC) curves for the Toronto Risk Score (solid), urinary β2-microglobulin (uβ2m; dots and dashes), and urinary α1-microglobulin (uα1m; long dashes). The ROC areas under the curves (AUCs) for progression were 0.78 (0.69–0.88) for the risk score, 0.80 (0.71–0.89) for uβ2m, and 0.79 (0.71–0.88) for uα1m. None of the areas under the curve differed significantly. Subsequently, analyses were performed in an attempt to improve the original risk score’s clinical usefulness. First and foremost, the goal was to determine if recalculating the risk score at later stages of follow-up was necessary. A risk score at the start of follow-up could not be calculated for 15 patients, because insufficient data points were available in these first 6 months. In the remaining 89 patients, the risk score calculated over the first 6 months was compared with the risk score obtained at the period of maximum persistent proteinuria. Table 3 shows the ROC-AUC for the risk score calculated during the first 6 months of follow-up, which was 0.76 (95% CI=0.65–0.86) and not significantly different from the AUC of the original Toronto Risk Score (P=0.46). In addition, Table 3 shows that the estimated GFR-MDRD6 risk scores discriminated between stable patients and progressors better than the original creatinine clearance-based risk score. However, the difference was not statistically significant. The risk score was broken down into its individual parameters to investigate which of these contributed most to an accurate prediction of progression. Table 4 shows the logistic regression coefficients, IDI and rIDI, for the original and estimated GFR-MDRD6–based risk scores calculated at the start of follow-up. The IDI is “the difference in means of predicted probabilities for events and non-events” (18). However, it is unclear what the magnitude of difference implies. Therefore, we also calculated the rIDI, which is the ratio in discrimination slopes for a model with and a model without a marker of interest. In a model that has four markers and perfectly predicts outcome, one expects the average contribution from each marker to the discrimination of events and nonevents to be roughly 25%. With the introduction of another marker, each of the five markers should contribute 20%. A strong deviation signifies a respectively high or low relative importance of a marker. Persistent proteinuria did not substantially contribute to the prediction of progression. The change in creatinine clearance was more important than baseline creatinine clearance, whereas the opposite was true for the estimated GFR-MDRD6–based model. Note that the models in Table 4 are not iterations of the same model with a different number of predictors; therefore, the rIDI can only be used to compare predictors within a model and not between models. Finally, because proteinuria did not contribute to the prediction of prognosis and the estimated GFR-MDRD6–based risk score seemed to outperform the creatinine-based score, we evaluated if the estimated GFR-based risk score without proteinuria could be used to accurately predict prognosis. Figure 3 shows Kaplan–Meier survival curves by tertiles of the estimated GFR-MDRD6–based risk score calculated using the first 6 months of follow-up. The overall P value for the log-rank test was <0.001. The highest tertile differed significantly from the first tertile (hazard ratio=17.6 [7.0–44.3]). However, the middle tertile did not differ statistically from the lowest tertile (hazard ratio=2.0 [0.7–5.6]). Survival until progression by tertiles of the estimated GFR six-variable Modification of Diet in Renal Disease (eGFR-MDRD6)–based Toronto Risk Score without proteinuria calculated during the first 6 months of follow-up. The eGFR-MDRD6 risk score was calculated as the logistic function of 1.26−0.3 · ΔeGFR-MDRD6−0.05 · eGFR-MDRD6 at baseline. For the Kaplan–Meier plot, follow-up duration has been truncated at 60 months. The eGFR-MDRD6 risk score was <0.10 for the low-risk tertile (solid line), 0.10–0.30 for the medium-risk tertile (dots and dashes), and >0.30 for the highest-risk tertile (long dashes). To the best of our knowledge, the current study is the first to directly compare the two most accurate, validated markers for the prognosis of iMN in patients who present with the nephrotic syndrome. We show that the Toronto Risk Score and uα1m and uβ2m measurements have similar prognostic value. Furthermore, the risk score can be adapted to improve its clinical applicability. First, accuracy is not higher for risk scores calculated at later stages of follow-up, and thus, a risk assessment can be made after 6 months of follow-up. Second, to calculate the risk score, estimated GFR may be used instead of endogenous creatinine clearance. Moreover, proteinuria did not contribute to the prediction of prognosis. Because serum samples can be readily obtained at outpatient departments and estimated GFR-MDRD6 can be automatically reported, our study suggests that a more practical risk score can be used in a clinical setting. The present study only included patients who presented with the nephrotic syndrome, whereas a considerable proportion of the population (24%) in the Toronto validation study was not nephrotic at presentation (4). Patients with persistent, limited proteinuria are known to have a favorable prognosis. Perhaps this difference in case mix may explain why proteinuria did not significantly contribute to the prediction of prognosis in our study. Another explanation may be that we used protein to creatinine ratios obtained from spot samples rather than 24-hour proteinuria. However, data from 44 patients who underwent repeated measurements in our previous study show that the variation for protein to creatinine ratio and 24-hour proteinuria is similar at initial and repeated measurement. In addition, the change in protein to creatinine ratio from initial to repeated measurement is strongly correlated (r=0.75) to change in 24-hour proteinuria. Therefore, we concluded that both collection methods are appropriate for prognostic purposes. In addition, progression was defined as an increase in serum creatinine>50% or >25% with a concentration of at least 135 μmol/L, whereas the work by Cattran et al. (4) used an endogenous creatinine clearance<60 ml/min per 1.73 m2 as an outcome. However, when analyses were repeated and only those patients who fulfilled both definitions were considered progressors, prognostic accuracy of all markers increased slightly; differences between the Toronto Risk Score and low-molecular weight proteins remained the same. Recalculating the risk score still did not add prognostic power, and the estimated GFR-MDRD6–based risk score without proteinuria remained as strong a predictor for prognosis as the original Toronto Risk Score. In conclusion, the choice of endpoint did not substantially influence our results. Aggressive use of renin–angiotensin blockers may explain the fact that calculation of the risk score at later stages of follow-up does not increase accuracy in the current study. Because these drugs reduce proteinuria, they may influence occurrence of maximum persistent proteinuria and thus, the prognostic power of the risk score. Indeed, in our cohort, the 6-month period of maximum proteinuria fell within the first 1 year of follow-up in 79% of patients. By comparison, in the study by Cattran et al. (4), this finding was the case in only 53% of patients. Unfortunately, because data on the use of ACEis and ARBs were not reported, we can only speculate. We were unable to calculate the risk score for all patients who met the inclusion criteria. These patients were, thus, excluded. However, the present study population did not differ from the cohort reported previously (2). Therefore, we consider selection bias because of lack of early follow-up data unlikely. Finally, although we used the validated multiplication factors from the original work by Cattran et al. (4), our modifications of the Toronto Risk Score, most notably the use of estimated GFR-MDRD6 instead of creatinine clearance, have not been externally validated. Therefore, the modified Toronto Risk Score may not perform as well in other patient populations. Our data show that both urinary low-molecular weight proteins and the Toronto Risk Score are suitable to predict prognosis. We prefer the use of urinary markers, because these markers provide an estimate obtained in a single outpatient visit. Still, if the assay is not available, use of the Toronto Risk Score is equally accurate. It has been suggested that information from the renal biopsy may aid in predicting prognosis. Particularly, the extent of tubule interstitial injury has prognostic value (19). These findings were confirmed in a recent study (20). However, histology did not independently predict outcome when proteinuria and serum creatinine were taken into account. In contrast to the original Toronto Risk Score, the estimated GFR-MDRD6–based risk score does not calculate the predicted probability of progression. Rather, it should be viewed as a dimensionless discriminant score. The higher the score, the more likely the progression. The most appropriate way to implement this adaptation of the Toronto Risk Score is to use risk strata. In the present study, tertiles of the estimated GFR-MDRD6 risk-based score correspond to discriminant values of <0.10, 0.10–0.30, and >0.30, which result in 20%, 40%, and 100% mean 5-year risk of progression for low-, medium-, and high-risk strata, respectively. Considerable improvements have been made in the prediction of prognosis of iMN patients over the last decades. Proteinuria remains an important predictor. However, when patients present with the nephrotic syndrome, the level of proteinuria does not discriminate between those patients with a poor prognosis and those patients with a favorable outcome. Other biomarkers, like the biomarkers presented in this paper, provide better discrimination in these patients. However, a subset is still misclassified. Therefore, future research should focus on more accurate early markers for disease progression or spontaneous remission, specifically for the patients who are still misclassified with markers presented in this study. Repeated measurements of uβ2m or uα1m may be useful, but more data are still required (2). A particularly promising marker is the antiphospholipase A2 receptor antibody level, because it is associated with disease activity in iMN (21). Prognosis of iMN patients who present with the nephrotic syndrome can be predicted with either urinary low-molecular weight markers or the Toronto Risk Score, because they have similar prognostic accuracy. The prognostic power of the risk score is not improved by adding proteinuria. Importantly, a score merely based on the estimated GFR-MDRD6 equation proved a reasonably accurate predictor. Thus, only serum parameters need to be used to predict prognosis of iMN patients, which greatly improves the practical applicability of the Toronto Risk Score. Future studies should focus on the subset of patients who are still misclassified. We would like to thank the medical and administrative staff at the participating centers. J.A.J.G.v.d.B. and J.M.H. are supported by Dutch Kidney Foundation Grant NSN OW08. Part of the data was presented at the American Society of Nephrology Renal Week 2010, November 16–21, 2010, Denver, Colorado. See related editorial, “Is Long-Term Prediction in Membranous Nephropathy (MGN) Better Than the Weatherman's Forecast Capacity?,” on pages 1203–1205.